Bulldogs guard Kamar Baldwin drives to the basket against Dayton Flyers' Jordan Davis. Butler shot 40 percent, including 7 of 23 from 3-point range. 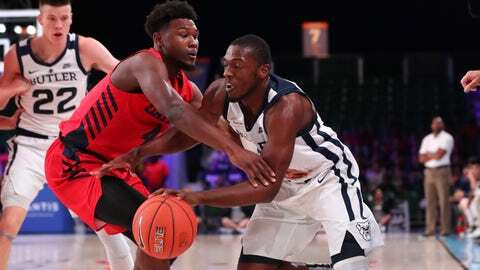 PARADISE ISLAND, Bahamas —Jalen Crutcher scored 20 points to help Dayton beat Butler 69-64 in Wednesday night’s first round at the Battle 4 Atlantis. Cunningham, a preseason all-Atlantic 10 first-team pick, missed the first two games with a hand injury suffered in practice. He had 20 points on 9-for-10 shooting in last week’s debut against Purdue Fort Wayne, and then made 7 of 11 shots while pulling down eight rebounds Wednesday.